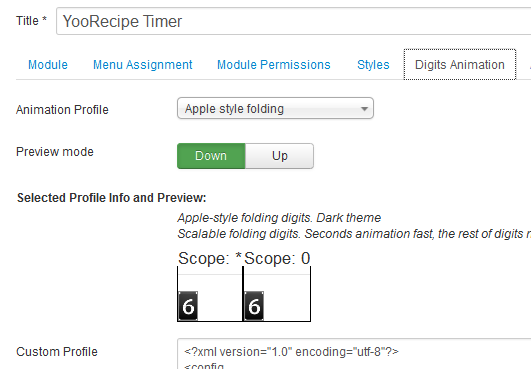 This article explains how to install and configure an NS Recipe module: NS Recipe Timer. Same logic applies to all NS Recipe modules. 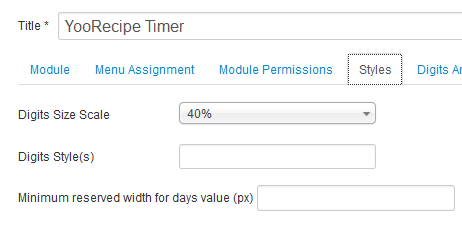 Notice: This article takes the NS Recipe Timer module as example. However, steps described are also relevant for other NS Recipe modules. Once this is done, please go to Extensions > Module and edit NS Recipes Timer module. Give your module a position, publish it, and set the access level permissions you want for your users. Here, you can define the default values for your timer and the sound played when timer expires. If digits displayed on the screen do not fit your column width, you still can reduce the size of pictures using the "Digit Scale" option. Other options should not be used. 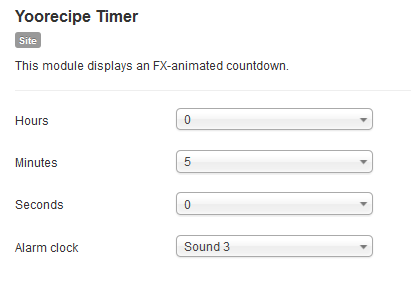 NS Recipe Timer comes with different animations. We recommend using the "Apple Style" option as it is the nicest!